Let's face it. Drax is a bit of a rube. References go over his head all of the time, he doesn't know what a metaphor is, and he might be Thor's new best bud. But then, all of that is exactly why Drax may just be the best character from The Guardians of the Galaxy movies. He certainly has the funniest lines in all of the films he's been in and his physique is truly second to none in the Marvel universe. The team wouldn't even be able to function without the big lug and if you're getting a team together to fight Thanos, then Drax is certainly the cornerstone to the look! So, what do you think? Are you ready to portray Drax? Do you have the perfect comedic timing of Dave Bautista? How about the physique to match? Well, don't worry about that last part, because this adult Drax costume will have you looking just like the Marvel superhero. This adult costume is officially licensed from Avengers: Infinity War. 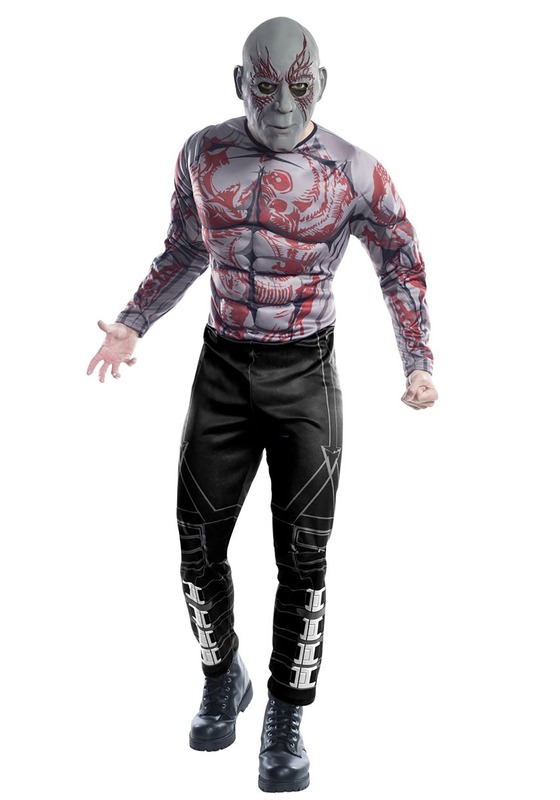 It comes with a jumpsuit that has plenty of muscle padding in the chest and arms to help give you the buff look of the real Drax. The exterior of the suit has his signature tattoos printed all over the top, while the bottom is designed to look like the pants seen in the films. Of course, it also comes with a molded vinyl mask that fits on your head with an elastic band. Once you have it all on, you'll be ready to deliver the funniest lines in the known galaxy! This Drax costume will really have you feeling like a true destroyer! If you want to take on Thanos, you might want to assemble a team. Be sure to check out our Star-Lord, Groot, Rocket, and Gamora costumes to complete your group costume. Then, you'll be able to shout, "Die, purple man!" with complete confidence!